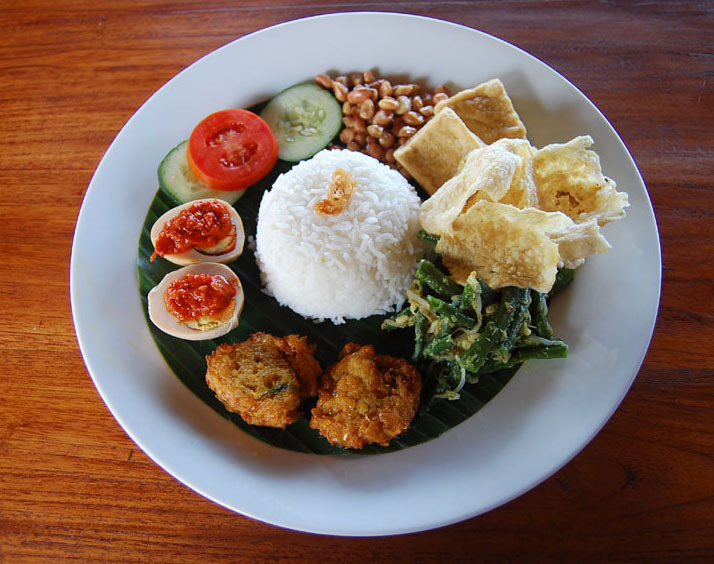 Rice is the staple food in Bali, eat rice three times a day, a meal is not a proper meal without rice. A Balinese might eat a big plateful of vegetables with some meats and some fruits but he has not had some rice, he will say he has not eaten yet. Usually, we eat our rice cold, in the morning we cook enough rice for the whole day, then we eat it cold for lunch and dinner. Though we don’t really have regular meal times like in the west country, our meal time is when we are hungry. A typical meal is a big pile of rice with a few vegetables and perhaps a small piece of fish or chicken ans some chilli sauce as a seasoning. We eat very litle meat, we only eat a lot of meat if there is a special religious holiday. Then we prepare roast suckling pig , roasted duck or chicken. Daily the women do the cooking at home but on the feast day, the men are the cooks.Indonesia was first known as the spice island, Balinese cooking as a rule is very spicy, we use a lot of chillies as well as spices like pepper, nutmeg, turmeric, etc. 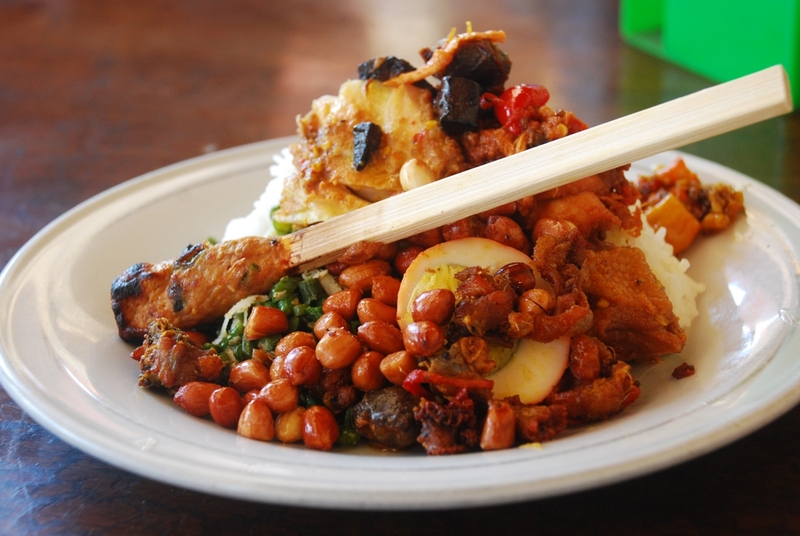 For westerners the Balinese cooking can be too spicy. Balinese eating is about the only thing they like to do alone. A man prefers to eat by himself in silence and he doesn’t use any chopsticks, knives and pork just the right hand. 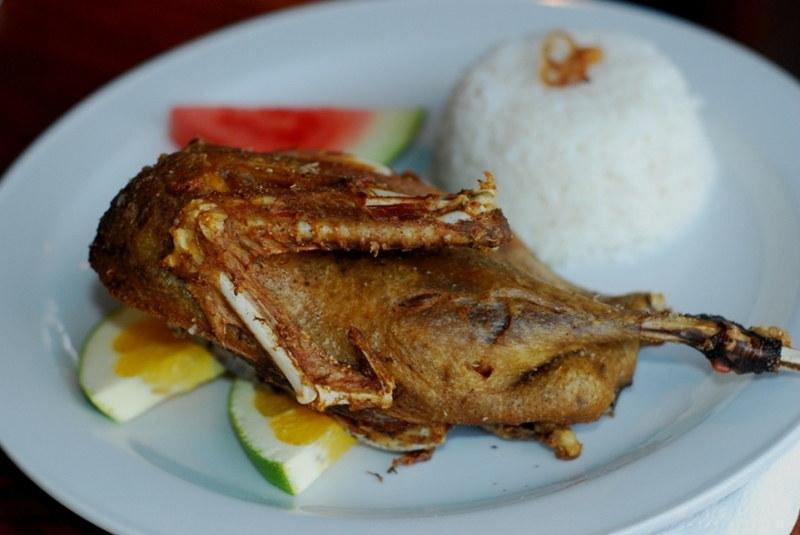 The Balinese eat very quickly, when we are small children, we’re taught that the quicker we eat, the more intelligence we will be, and the people don’t like to throw rice away, if the children don’t want to eat all their rice, their parents tell them to finish it at all, otherwise the black chicken will die..